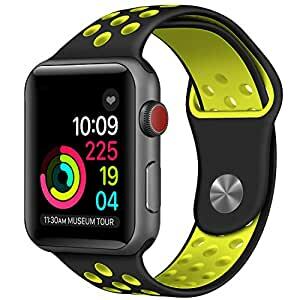 Â Durable Material: Â The apple watch bands are made of pure silicone and flexible elastomer. Durable and soft silicone material across your wrist, improves airflow and comfort, bring you a comfortable wearing experience. Band comes with Watch Lugs on both ends, which locks onto Apple Watch Band Interface precisely and securely. Easy and direct installation and one button removal. An innovative pin-and-tuck closure ensures a clean fit. Metal parts made with hypoallergenic nickel free stainless steel. So if you have any problem, please contact us without hesitation.